French President Emmanuel Macron says fighting Islamist terrorism will be his top foreign policy priority. Defeating so-called Islamic State (IS) in Iraq and Syria must go hand-in-hand with anti-terror measures in Africa, he told some 200 French ambassadors. He called the security of French citizens "the raison d'être of our diplomacy". IS-inspired terror attacks in France have killed more than 230 people since early 2015. "We need an inclusive transition in Syria," he said, adding that France and its partners would have to invest in the reconstruction of both Syria and Iraq. "We need to win the peace in both countries." He also spoke of some "specific results with the Russians" on preventing further use of chemical weapons in Syria, but did not elaborate. "Providing security for our citizens means that the fight against Islamist terrorism is our first priority," he said. Within weeks of becoming president, Mr Macron held separate talks with Russian President Vladimir Putin and US President Donald Trump in Paris, visited French troops in troubled Mali and toured Central and Eastern Europe. But recent opinion polls suggest a big slump in his popularity. Besides security, he stressed that French independence would be one of his foreign policy priorities. Another would be restoring French influence internationally. He noted that poverty was a driver of African migration towards Europe, and stressed the importance of development aid for the Sahel region. That was the focus of talks he held on Monday with the leaders of Niger, Chad and Libya, and European partners. "Africa is a continent of the future - we cannot just leave it alone," he said, outlining a strategy of "creating an axis between Africa, the Mediterranean and Europe". This year some 125,000 migrants have crossed the Mediterranean on perilous journeys, during which more than 2,000 drowned. More than 90,000 of them reached Italy's shores, mostly fleeing violence and chaos in Libya. 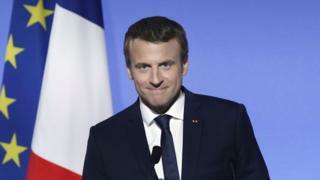 "Italy and Libya expect more support from us, which we must provide," Mr Macron told the diplomats. He announced that France would have a special envoy to steer negotiations on the migration crisis. He is pressing the EU to help establish new centres in Chad and Niger to process asylum applications. The idea is to curb the flow of asylum seekers who are exploited by people-smugglers in Libya and who risk their lives aboard overcrowded, unseaworthy boats. The new centres would focus on identifying genuine refugees who qualify for asylum. "It's a human duty to welcome migrants," he said, while admitting that "it's a considerable challenge for all European countries". Turning to the EU's challenges, he said "we can't let Europe get bogged down in technocratic quarrels". The answer to voters' sense of malaise with the EU, he said, was to reinvigorate democratic participation. "Europeans need to take ownership of the European idea," he said, adding that the UK Brexit vote happened "because for years we didn't dare to make proposals". "Europe suffered too much from being a crisis management union... we've got to build a union that is highly ambitious and protective." He called for an EU of "several formats", to give space to those members wanting to integrate faster than others.